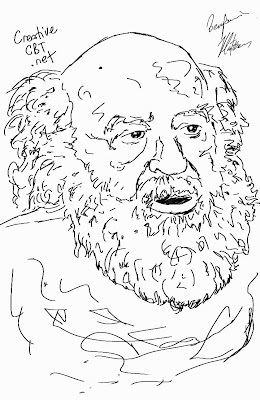 Two sketches I did of Fritz Perls this week. 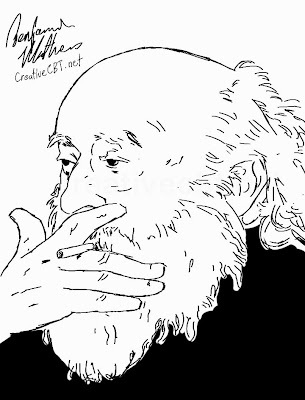 In the first image he is smoking, in the second he is not. For those of you that are familiar with him, you might find him difficult to recognise without a cigarette in his mouth ;). Fritz Perls is known for Gestalt therapy, the empty chair technique, his emphasis on personal responsibility and an emphasis on the 'now' rather than the future and the past. In addition to these things it can be said that his technique was, at times, uniquely blunt, aggressive and hard hitting. Keep reading for a more in depth introduction to Fritz Perls and his techniques. Fritz introduced the empty chair technique to therapy, a situation in which the client takes turns addressing an empty chair as if it were, for example, the mother who made their life hell, and then the client goes on to take the role of the mother addressing the client. During these techniques Fritz tries to get the client to be authentic and to express their feelings fully, and powerfully. He will pick up on key sentences that the client mentions and get them to repeat them over and over, each time louder and more clearly than before. This technique is a fantastic tool for encouraging expression, for dealing with unresolved issues and for self discovery. Like Rogers, Perls did not believe in interpretation, he believed that the client knows their thoughts better than the therapist. Unlike Rogers, Perls could tend to be more aggressive with clients at times, almost to the point of undermining them. Perls was not afraid of annoying his clients, and he loved to point out when he thought clients were being "phoney". I have mixed feelings about Fritz and his techniques. Some of his techniques I find very intriguing and useful, others I believe are too abrasive and unsuited for most clients. None the less, I feel that he was a master at what he did and that he made a massive contribution to psychotherapy. 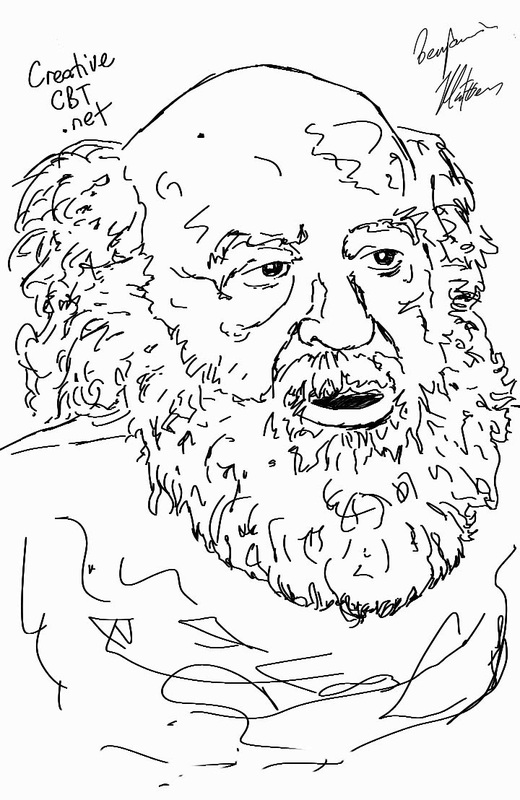 I am working on another sketch of Perls at the moment, but I haven't gotten it right yet. In the sketch that I am currently working on he is smoking. Pearls couldn't seem to go 10 seconds without having a cigarette in his mouth, even during therapy sessions.